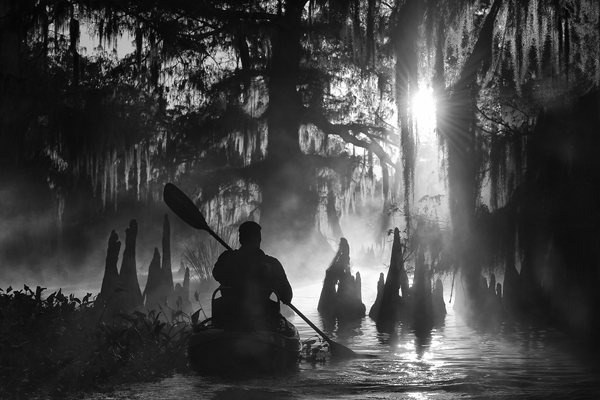 Pictures of Louisiana (including the one above) are part of a portfolio with which Marsel van Oosten, a Dutch nature photographer, has just won the Travel Photographer of the Year competition. They put me in mind of the work of James Lee Burke, who in his novels about Detective Dave Robicheaux conjures a world in which you can smell the bayou and all but taste the po’boy sandwiches. They reminded me, too, of a programme broadcast earlier this year in the “Crossing Continents” slot on Radio 4 by James Fletcher. It’s about erosion of wetlands in southern Louisiana caused by the taming of the Mississippi and oil and gas exploration. A football field of coastal land is being washed away every hour.